After a long, grueling twin pregnancy, I gave birth to Parker and Aurora on July 31, 2014 at 35 weeks gestation. They were perfect. And my family was complete. I had three beautiful, happy and healthy children. So I thought. Everything was going along smoothly until shortly after the twin’s 12 month check up. Shortly after this wellness visit, I started to notice that Aurora had quite the distended belly. 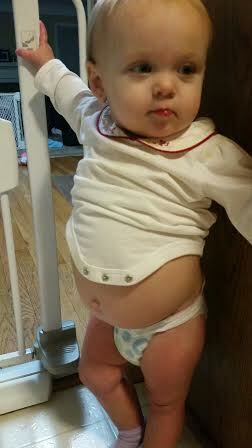 We laughed and joked and often called her “Buddha belly,” thinking most babies have big bellies, right? But something just wasn’t right. Her belly was pretty hard. Many weeks went by and I thought Aurora had a gluten or food allergy. I thought I would mention it at the twin’s next well visit at 15 months. I wasn’t too worried. However, on Monday, November 17th, 2014 I had come home from a long hard day at work. I caught a glimpse of Aurora out of my eye. There she stood, big ol’ smile on her face, with her shirt pushed up over her belly. Her belly was the largest I have ever seen it. I grabbed my camera and took a picture. Something was wrong. Aurora did not have a fever. She was eating, peeing, pooping, everything just as she should. What was wrong with her, I didn’t know. Perhaps a severe food allergy. I didn’t know, but what I did know was that I needed to get her to the hospital. They call this “mommy intuition” and I get the chills just wondering about what was guiding me this particular day. Imagine how dumb I felt when the doctor on call at Aurora’s pediatrician’s office asked, “Does she have a fever? Is she vomiting? Is she crying? Is she having any issues eating / drinking / peeing / pooping?” My answer to all of this was “No.” I thought for sure the on-call doctor would say just wait until the next well visit (within a week) and we will run some blood work. But this doctor did not say that. Instead, she said “Kelly, I can tell in your voice that something is wrong. Head on over to Beaumont.” I did just that. I looked my husband in the eyes, teared up and told him I had to go. “Stay here with the other kids.” I had no idea that this day would change our lives, forever. I got over to the after hours clinic. Once we arrived, Aurora’s belly didn’t look as distended as it did while we were at home, just 30 short minutes ago. So odd I thought. They are really going to think I am crazy. Thank goodness I took that picture on my cell phone. The nurse measured Aurora’s belly and within minutes a doctor entered our room. She told us that they would be transporting us over to the ER. They loaded Aurora and I up in a wheelchair and whisked us away to the ER. We were there for a very short period of time before a doctor came in our room. She looked Aurora over then sat down. This is a conversation I will never forget. The attending physician said “so, mom, what is your worry?” Oh no. She for certain is thinking I have lost my mind. Until, when I started to speak, I started to cry. I said “I don’t know. Maybe a growth?” The doctor nodded her head. “I agree with you. This is not good. I am not going to sugar coat anything. You might not get all your answers tonight, but we will be admitting you.” What I didn’t know was at this time, the doctor could physically see and feel Aurora’s tumor on her right kidney. They send us for an abdominal x-ray. The x-ray revealed that Aurora had what was suggestive of a very large mass in her abdomen. Aurora would need an ultrasound next. There wasn’t a pediatric radiologist on call, so we were admitted until morning. That night, minutes after being admitted to the pediatric floor, we were being whisked away to the PICU. Aurora had dangerously high blood pressure readings. What time would reveal was that Aurora’s tumor was pressing on her IVC, causing the elevated blood pressure. After the ultrasound, Aurora had to have a sedated CT scan. The CT scan confirmed that Aurora had a tumor in her right kidney that was almost the entire size of her abdominal cavity. I will never, ever forget this day. A literal team of doctors were in our room to tell me,”We are so sorry. 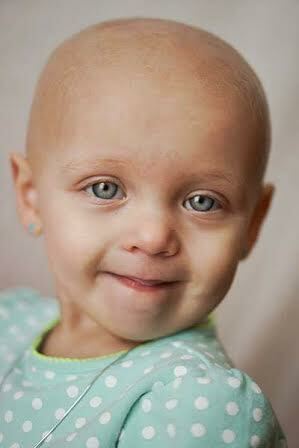 Your daughter has cancer.” The type of cancer Aurora has is called Wilm’s Tumor. It is a tumor that originates inside either, or sometimes, both kidneys. Aurora’s scans had showed no signs of metastases to the heart, the liver or lungs. Those are the common places Wilm’s will spread. On November 20th, 2014 Aurora had undergone extensive surgery to remove the tumor and entire right kidney. In trying to spare other organs, the surgeons knicked the tumor causing tumor spillage. That bumped it to Stage III. On December 1st, 2014 Aurora began a round of six consecutive flank radiation treatments. We had to arrive early to the hospital every day for IV sedation. What an awful week that was. Then, once her radiation treatment was completed, it was time to focus on her 25 week chemotherapy plan. It was a grueling time. Hospital stay after hospital stay for viruses, fevers, blood transfusions, and so on. Aurora had even experienced what one neurologist called “chemo induced toxic leukoencephaly” (brain damage cause by chemo). nother neurologist called it “post infectious ADEM” (brain damage caused by an infection). Either way, my daughter couldn’t walk, sit and/or stand by herself. Luckily for us, this brain damage was reversible. At one point we had a scare. They found a 3 cm mass in her tumor bed. Luckily, after more scans and finally a core biopsy, we learned that it was a hemostatic agent used during her surgery. Aurora finished her last round of chemo on June 8th, 2015. She had her port removed on August 10, 2015. She will be scanned every three months for the next two years due to the fact that Wilm’s tumors have a chance of spreading to the heart, liver, other kidney and lungs. We still have a life long journey ahead, as no one really knows the life long effects the chemo drugs have on these small children. The doctors are unable to tell me if my daughter will suffer infertility due to the area in which she had radiation. We have learned to live one day at a time, sometimes, one hour, one minute at a time. And for now, Aurora is NED (no evidence of disease) and we’ll take that! Kelly Wadle is a plain old mom, who has been blessed with a gorgeous 7 year old daughter, Belle, and two incredible 2 year old twins, Parker and Aurora. She continues to be inspired everyday by her children and all the other families who are fighting or have fought the cancer beast. Kelly lives, works and plays in Royal Oak, Michigan.